With a relatively small number of growers in both Quincy and Reuilly and a fair amount of cross-pollination (a reference to various Quincy producers now making wine in Reuilly), I have offered a combined ‘Ten of the Best’. It’s no coincidence that the two most prolific growers in Reuilly (and who are both dedicated solely to the vine) enjoy the greatest reputation and are obviously included in the ‘Top Ten’ below. The precocious nature of these wines means that no tasting notes are offered. Evaluations have been made primarily using the 2009 vintage as a benchmark. The growers are listed in alphabetical order. Reuilly is a rather dull little town that comes to life once a week when the Main square is abuzz with market traders plying their wares. Given the average age of the clientele, one could be forgiven in thinking that many might have been making the Friday pilgrimage ever since 1675 when the town received its own charter to host a weekly market from Louis XIV. The first time visitor might well question whether Reuilly is at the heart of a wine producing region at all given the apparent absence of vines. Situated on the eastern edge of the Indre département, arable farming dominates this landscape, with vast prairies stretching as far as the distant horizon. The vineyards appear almost incidental especially in light of the fact that the average céréalier personally holds more land than the entire 200 hectares that make up the appellation. But Reuilly’s modest wealth was not built on agriculture. Whilst its name has been associated with wine for centuries, the town’s history revolves more around minor industry prompted, initially in 1847, by the arrival of the railway which adjoined it to the Paris to Toulouse line. Would be industrialists soon arrived and began establishing textile mills along the banks of the Arnon. By 1851 the population of the town had boomed to 2,500 due to the ready supply of work. In their time the mills provided employment for 500 people, with Reuilly enjoying a reputation for the quality of its undergarments. At one point road signs into the town proudly proclaimed ‘Reuilly, ses vins et sa lingerie’. Whilst most other agricultural regions of France have political leanings to the right, the majority of the inhabitants of Reuilly tend to hold opposing views, a legacy of its proletarian past. Even today it supports a socialist mayor, Patrick Bertrand (who has held office since 1996), with the political division in the town extending as far as the annual Saint-Vincent festival with the vignerons of Reuilly celebrating two Saint-Vincent festivals in January - one for either side of the political divide - although not necessarily on the same day. The economic crisis and the poor run of vintages in the early 1970s had an adverse effect on viticulture resulting, in 1977, to plantings dwindling to just 48 hectares. It was not until the late 1980s that there was any sense of revival as farmers, distressed by low cereal prices, looked to take advantage of the growing demand for Sauvignon based wines. Subsequent improvements in quality over the past two decades come down to the pioneering spirit of Claude Lafond (or, in Quincy, Jean Tatin) who helped co-ordinate these agriculteur-vignerons, encouraged the planting of better quality vineyard material and were instrumental in establishing a central co-operation (rather than co-operative) cellar which, in itself helped to ensure that the overall quality delivered within the appellation is consistently high. Organic vineyard growth and a strong domestic following have also ensured that supply never appears to exceed demand and prices remain stable (and sensible) as a result. Yet satisfyingly, prices are generally considerably lower than those commanded by the Sancerrois, with the wines of Reuilly generally being between two-thirds and three-quarters that demanded in Sancerre, whilst the overall quality is often its equal. Unlike in Quincy, however, there is no active négociant market, with all the wines of Reuilly being sold by bona-fide producers. Until the late 1990s there was practically no demand on export for the red wines of the appellation, with all rouge and gris consumed locally. According to the Bureau Interprofessionnel des Vins du Centre’s (BIVC) official figures, Reuilly exports just 16% of its production, (compared to Sancerre’s 53%) which can be ascribed to a lack of international recognition and to the understandable confusion that exists between the appellations of Reuilly and the Burgundian Rully. Despite the close proximity of Reuilly to Quincy (they are no more than ten minute drive apart) it is surprising that there has been no historic cross-pollination between the two appellations. It is only with the current generation of growers that this has started to happen with the vignerons of Quincy exploiting Reuilly’s right to produce red, rosé and gris, thus helping the growers to embellish their existing mono-cépage offering. The decision is purely commercial. Grape pips found in large quantities on the banks of the river Arnon at Lignières, about 50 kilometres upstream of Reuilly, indicate that an ancient settlement had actively cultivated the vine. Certainly vineyards have been cultivated in the Berry since Roman times, although no documentary evidence exists as to which varieties these might have been. Officially the vine arrived in Reuilly via the church when, as legend has it, King Dagobert I (628-637) donated Ruilliacum (the original name of the town which dates back to 526) its meadows and vineyards, along with another 22 villages, to the monks of the Abbaye Royale de Saint-Denis-en-France, located just to the north of Paris. The exact dates offered in various texts conflict with one another, but possibly either 630, 637 or 645. The town was attacked and pillaged by the Normans in 902 and also suffered invasion by the English during the Hundred Years’ War before being recaptured by Bertrand du Guesclin in around 1370. It’s believed that Sauvignon Blanc was selected from wild plants (or sauvages, hence the name) by the Benedictine monks who established vines at the abbey at Beauvoir, close to Quincy, during The Middle Ages. Meanwhile it was Augustine monks who were responsible for planting Savignum around the abbey at Saint-Satur (at the foot of the famous hill of Sancerre) and at Charité, located on the bank opposite Pouilly-sur-Loire. The religious influence during this period extends to various depictions of the viticultural year - in both painting and sculpture – which can be observed throughout the churches of the Berry; recently restored stone carvings on the Gothic porch of the Cathédrale Saint-Etienne in Bourges were originally completed in around 1225. In 1202, religious leaders, installed at the Abbaye Royale de Saint-Denis implemented a charter giving the Prior the sole right to sell the wine of Reuilly. Similarly, in 1365, Jean, Duc de Berry (1340-1416), son of King John II, issued a document which governed its production; fixing the date of the harvest and also establishing a levy on all the wine from Reuilly. Later, in 1466, reconfirmation of the charter of 1202 reserved three days a year at the local priory for the sale of the new vintage and set out the amount that each wine grower had to donate to their overlord. During this time, the reputation of the wines from the vineyards of Reuilly was spreading further than the medieval towns of Bourges and Vierzon as barrels were shipped along the tributaries of the Cher and Arnon to their confluence with the Loire and then transported as far as England and Flanders. Around 1557 Nicolas de Nicolas, geographer to Henri II (1591-1559), heaped praise on the wines of Reuilly, pronouncing them the best produced in the Berry and nine years later, Jean Charmeau honoured the vineyards of Lury in his work L’Histoire du Berry. Later, in 1701, Gaspard-Thaumas de la Thaumassière (1650-1715) an historian and legal advisor based in Bourges , put Reuilly at the top of his list in his book Coutumes du Berry. In 1685 the court of Louis XIV granted Jacques de la Fond, Seigneur de la Ferté (and secretary to the King) 179 arpents (5.25ha) whilst the Prieur de Reuilly was granted 245 arpents (about 7.2 hectares) of vineyard land. During this period the vines extended to between 250 and 300 hectares in size. After the French Revolution the vineyards attached to the Château de la Ferté and those of the Abbaye Royale de Saint-Denis and La Commanderie de l’Ormeteau were sold off. During this period, the vineyards extended to around 200 arpents (about 102ha) in Diou and neighbouring Migny, 450 arpents (229ha) in Reuilly, with vines extending far and beyond the town of Issoudun, some twenty kilometres to the south. In 1816, André Jullien, the most renowned commentator on wine of his day, celebrates both Reuilly and Chabris (a village to the north-west on the banks of the Cher) in his work Topographie de tous les vignobles connus for the quality of their white wines. In 1864 the wines of Issoudun were served at the table of Napoleon III and a barrel of wine from local vigneron and mayor of Reuilly, a Monsieur Martin (a name still associated with viticulture in the appellation), was given to the Emperor. Until the end of the 19th Century both red and white wines were produced in the region, but with increasing competition from producers in the Midi , the growers began to increasingly vinify their red grapes as gris. The first recorded incidence of phylloxera in the Indre was in 1878 and by 1884 it had been identified in the commune. Within a period of just five years, plantings had dwindled from 340 hectares to less than 100ha. In December 1885 the first American vines were distributed (with ten different cépages available) along with rootstocks which included Rupestris, Riperia and Solonis. The growers established their first ever syndicat in 1889. The acknowledged father of the appellation was Doctor Lucien Apard (1886-1975). 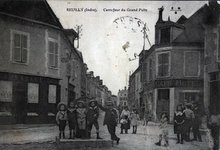 Mayor of Reuilly between 1929 and 1944, Dr Apard initiated the discussions with the fledgling I.N.A.O. and as a result, Reuilly was awarded AC status in 1937, just a year after the Appellation Contrôlée system started. At that time, the right to the appellation was awarded to four communes only: Reuilly, Diou, Lazenay and Chéry and was for white wine only. For the first four years of its existence, Sauvignon only had to represent 60% of the blend; the balance being made up of a wide range of other varieties that included Chasselas, Muscadelle, Vouvray (Chenin), Pinot Blanc, Damery, Gamay Blanc and Melon, but in the first of several revisions, in February 1941, the authorities abolished all the non-Sauvignon varieties. After the Second World War, the vogue was for rosé and local restaurants would serve Vin Gris de Pinot Gris by the fillette (a half bottle in Burgundy or 500ml elsewhere in France). Vigneron Gérard Cordier’s grandfather used to deliver barrels of gris to bars and cafés in Vierzon and Bourges, where customers would order a chopine - a half litre carafe - and drink it from beakers. As a result, local growers lobbied the authorities for their gris and rosé wines to be legitimised, so in August 1961 the appellation laws were re-written to include Pinot Noir and Pinot Gris. Whilst Gamay was established within the vineyards of Reuilly during this period, it was decided to exclude it from the décret. In 1962, the local grower syndicat created La Maîtrise des Echansons de Reuilly, whose objective continues today in promoting the wines of the appellation. A decade earlier, during Easter 1953, the inaugural Foire aux Vins de Reuilly was held in the town - a tradition that is still repeated every Pâques. A further revision in 1973 extended the appellation to include the villages of Cerbois, Lury-sur-Arnon and (controversially) Preuilly, a commune that, logically, should have been included as part of the Quincy appellation in the 1936 décret. During the 1930s there were around fifteen growers in Preuilly and whilst there was some Pinot Noir planted in the commune, Sauvignon was the dominant variety. There are various reasons cited for the exclusion, one being that the vignerons of Preuilly didn’t want to be part of this new initiative, clearly not understanding the long term benefits. Another theory is that the growers simply were not consulted or, at most, their advances were resisted by those in Quincy and Brinay - or that the then mayor of Preuilly simply was not aggressive enough in lobbying on the producers behalf. 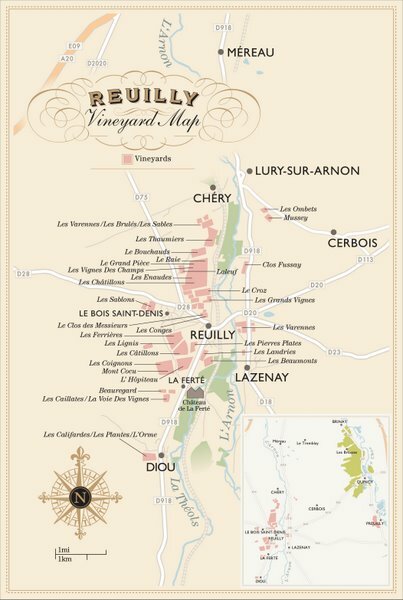 The net result was that Preuilly remained a viticultural backwater for the following 37 years, forced to sell its wines as simple vin de table, until the invitation to join the Reuilly appellation came along. Established in 1992 and based in Bourges, Agri-Cher was a co-operative set up for processing and selling cereals. As part of their expansion plans they also began to diversify into poultry and wine. Several growers in both Quincy and Reuilly, including the domaines of Jean-Paul Godinat, Domaine Houssier, Dominique Picard and the Sicard family (who were heavily involved with Agri-Cher by way of their position as local landowning gentry) all signed up to the scheme where they supplied their grapes to the co-operative. The grapes were then vinified in a purpose built cellar erected mid-way between the communes of Preuilly and Quincy. The wines were then sold and marketed by Agri-Cher; or at least that was the theory. Although wine was only a nominal part of their business, the run of poor vintages during the early 1990s did little to help their cause and the co-operative failed in 1996/7 leaving those who had supplied it with grapes a legacy of unsold (and unsaleable) wine. The origins of the Chai de Reuilly date back to the early 1990s when advisors from the European Unions Common Agricultural Policy, or Politique Agricole Commune, arrived in the Berry and started to recommend that cereal farmers start to explore their options for crop diversification, stating that there were government subsidies in place for the planting of vines. Within a period of just two years, between 1990 and 1992, ten new vignerons appeared in the appellation. The immediate issue then was that these new growers were about to find themselves in the situation of having a crop but no winery in which to process it. Enter Claude Lafond, to many the saviour of the appellation. Claude was already considering erecting a new cellar for his own production (until now it had been made in a modest shed at the rear of the family house and was too small and badly outdated). It was a perfect fit; Lafond had the viticultural knowledge and the cereal growers had the cash. So in 1992 Claude instigated the formation of an association of eight like minded growers and the Chai de Reuilly was conceived. The cellar was erected, in the back yard of Lafond’s own property, in early 1993 and it received its first crop the same year. But this is no cooperative in the true sense of the word. As a co-operation cellar its objective is to share resources (as opposed to grapes) such as the services of a dedicated oenologue (originally Emmanuel Roux and, since 2001, the very capable Stéphane Vaillant) and equipment. What comes out of the cellar is their own wine from their own grapes, with each producer as competitive as the next in finding a home for their current vintage. The principle is so simple and sensible that it’s amazing that no similar scheme in any other marginal wine region has emanated from it. In Reuilly, the initiative has worked so well that as additional shareholders came forward the facility had to be expanded in 2004. As of the 2009 harvest the Chai de Reuilly was processing 80 hectolitres of wine, representing around 45% of the appellation. In 2009, however, Claude Lafond ironically announced that he had decided to leave the co-operative and erect his own cellar – right next door. His final vintage was in 2010 and Claude, together with his daughter, Nathalie, look to vinify the 2011 harvest in their new facility. As the largest producer in the appellation, it does have a significant impact on the dynamics of the Chai de Reuilly with production dropping as a result. Denis Jamain , who is currently second to Lafond in size within the appellation, will become the most significant grower in the Chai, accounting for 35% of the Chai’s output. The vineyards of Reuilly sit on a series of small hills which straddle both banks of the river Arnon. The only exception to this is the commune of Preuilly which is located ten kilometres to the west on the left bank of the river Cher. The parcels of vines range from between 107 and 167 metres in altitude and are generally south, south-west or south-east facing. The appellation extends over seven villages: Chéry is the northern-most commune and has a nominal amount of isolated parcels. Reuilly and Diou are situated at the edge of the Indre département and combined they account for around 70% of the appellation, whilst Lazenay, Lury-sur-Arnon and Cerbois (which are all located on the right bank of the Arnon) are in the département of the Cher. The village of Preuilly has around 400 inhabitants and whilst it has only one resident vigneron, it accounts for around 20% of the appellation with growers planting more of the two Pinots here. The hamlet of La Ferté (which is technically part of the commune of Reuilly) has a number of vignernon-agriculteurs although there is no real need for them to sell their wines much beyond their own road-side cellars; the amount of traffic passing between Issoudun and Vierzon appears to provide them with a sufficient enough market. Prior to the wines receiving the appellation they were sold as Coteaux de l’Arnon, the name applying equally for the white wines which also carry the designation Sauvignon. Les Sables - As the name suggests, this is a parcel of sand and gravel on a plateau just to the south of the village of Chéry. Domaine Cordaillat has vines here. Le Croteau Loup – Also in Chéry, the name of this lieu-dit was noted on an old bottle found in the wine museum in Reuilly. Crot au Loup is a side street in the centre of the village, suggesting that the vines were probably located in a growers back garden. Mussay – A tiny parcel located on the right bank of the Arnon, just south of the commune of Lury-sur-Arnon, on the road to Cerbois. Les Thaumiers – This parcel of clay and limestone soil is planted to Pinot Noir by Domaine Mabillot and with Sauvignon and Pinot Gris by Claude Lafond. Les Enaudes – A south facing slope worked by Domaine Coraillat and Dyckerhoff. Les Bouchauds – Located on the south facing slope above La Raie. The main protagonist here is Domaine Bigonneau, whose cereal farm is just adjacent to the vineyard. La Raie – This parcel sits at the northern extremity of Reuilly commune. The vines here are south facing on a soil of clay, sand and gravel. Claude Lafond has six hectares of Sauvignon planted here, his largest single holding. It is easily recognised by the sole wind turbine that sits towards the edge of the vines. Laleuf – This small parcel takes its name from a smallholding just off the road to Massay. The soils here are mainly clay and limestone. Les Chatillons – Closer to Reuilly but also off the main road to Massay, this south facing parcel has only relatively recently been replanted, although there are numerous historic references to the site. Denis Jamain (who has Pinot Gris planted) is one of a number of growers here. Le Croz – Historically known as Le Crots, Claude Lafond has Sauvignon and Pinot Gris planted in this parcel. Les Grandes Vignes – The soil here is a sandy-silt and is best suited to Pinot Noir, which is what Claude Lafond has planted here. Le Clos des Messieurs – Also known as Le Clos des Seigneurs, this parcel enjoys the reputation as being the best lieu-dit in the appellation. It is located directly above the village of Reuilly and enjoys attractive views over the Arnon valley. The soil is mostly fractured limestone which is compacted with seashells. The origin of the name is explained by the fact that it was once owned by one of the towns bourgeois families. Although the parcel is not a monopole (Guy Malbête has Sauvignon and Pinot Noir planted here), Claude Lafond claims ownership of the name in producing a site specific Sauvignon cuvée from here. Les Conges – This parcel is situated next to Le Clos des Messieurs and enjoys a south-west facing exposure. The soils, however, are less distinguished – mainly gravel and sand - which explains why the likes of Jamain, Mabillot and Dykerhoff, who all share this parcel, all have established Pinot Gris. Le Clos des Sablons – This parcel sits on the western edge of Le Bois-Saint-Denis and is worked by Guy Malbête. As the same suggests, the soils here are particularly sandy. Les Lignis – Also known as Les Lignys – is located at the western edge of Reuilly on the top of a small plateau. Several growers share this parcel including Valérie Renaudat, Pascal Desroches and, more recently, Jacques Tatin who has planted Pinot Gris and Sauvignon here. Les Pierres Plates – This gentle east facing slope is made up of pieces of fractured limestone, which give Les Pierres Plates its name. The parcel was known to have been planted in the 7th Century. Aesthetically, it lacks the charm of Les Clos des Messieurs, but nonetheless this is at least equal to it in terms of potential quality it’s Sauvignon. The parcel is owned by Denis Jamain who also has four hectares of Pinot Noir planted here. Les Ferrières – This south-facing slope is located between Les Lignis and Les Pierres Plates towards the heart of the town. Guy Malbête has ten hectares planted here. Mont Cocu – Historically known as Montcocules, this parcel takes its name from a nearby spring. The soils are shallow clay mixed with sand and limestone which tends to ripen a little later that other adjacent plots. It is planted mostly to Sauvignon with the main grower being Domaine Mabillot who started to bottle a site specific example from the 2008 vintage. Les Coignons – Old bottles in the museum in Reuilly note the alternative spelling of ‘Les Couagnons’. This south facing slope is planted mostly to Sauvignon. Jacques Tatin has just established vines in ‘Le Bas des Coignons’ and Denis Jamain has ten hectares of Sauvignon planted for his generic label. Beauregard – Referred to As ‘Beauregards’ by Pierre Galet in 1962, this is the name of the largest parcel within the hamlet of La Ferté. Les Beaumonts – Sandwiched between the D918 and the river, this is the other significant parcel in La Ferté. Mirabeau – This lieu-dit sits half in the commune of Quincy (and is therefore planted to Sauvignon) and half in Preuilly, where Domaine Mardon have established Pinot Noir. La Fontaine – Jean-Michel Sorbe has plantings of Pinot Gris here. Les Justices – Jean-Michel Sorbe has Pinot Noir and Sauvignon Blanc planted here. Pointe de la Motte – Also planted to Pinot Gris and Pinot Noir by Jean-Michel Sorbe. Terre du Moulin – Sorbe has all three varieties planted here. Les Ruesses – Planted to Sauvignon Blanc by Jean-Michel Sorbe. La Commanderie – The most renowned lieu-dit in Preuilly. It’s a relatively large parcel with more complex soils, allowing it accommodate all three varieties. The Sauvignons that are produced here are said to be more in style with Quincy. Jean-Michel Sorbe has plantings here with some of the Sauvignon predating the inclusion of Preuilly within the appellation in 1973. More recently, Jean Tatin has established 1.5 hectares of Sauvignon and Pinot Noir on land owned by his maternal family. Reuilly enjoys a continental climate; cold winters with relatively hot, dry summers. The average rainfall is, at 660mm a year, slightly less than in Quincy with the majority falling between October and February. Prolonged periods of precipitation between June and September are considered rare. Localised hail can occur during the spring and summer although the valley of the Cher appears to suffer more than the Arnon. Some growers in Preuilly lost 30% of their crop to hail in 2009. There is less risk of frost here too. The vines are noticeably planted on slopes – unlike those in Quincy - with the cold air rolling down towards the river and averting the danger. Certainly, the wind turbines, or éoliennes, are less in evidence here than in Quincy. The first, installed by Claude Lafond in 2001 in the lieu-dit of ‘Le Raie’ and the second erected in a parcel of Sauvignon at Château Gaillard in 2004, are capable, in theory, of protecting some 10-12 hectares from frost. At the end of the growing season, Reuilly is almost always the first of all the Loire’s Sauvignon appellations to harvest, usually around ten days ahead of Sancerre. The reasons for this are two-fold. Firstly, Sancerre (at an average of 310 metres) is at a much higher altitude than Reuilly so is invariably cooler, and secondly, the amount of active lime in the soil (see below) also accelerates the ripening process. Reuilly is, therefore, a very reliable source of Sauvignon since it is less prone to the vagaries of the late autumn weather. Reuilly sits at the south-western extremity of the Kimmeridgian Chain, a relatively narrow band of hard Portlandian limestone which runs diagonally across northern France for approximately 200 kilometres. The bench rises in the Aube (the southern-most part of Champagne) and takes a south-west course which encompasses the vineyards of Chablis. In the Centre it is known colloquially as either the calcaire du berry or la champagne berrichone (so called because the Kimmeridgean marne is almost identical in profile to that found in Champagne ) and there can be little coincidence that the vineyards of the Coteaux de Giennois, Pouilly-sur-Loire, Sancerre and Menetou-Salon all rest of this cordon of rock. At Reuilly, a final outcrop of the Kimmeridgean appears on the left bank of the river Arnon before it descends below the lower Cretaceous. The village of Lazenay on the opposite bank of the river is at the south-western limit of la champagne berrichone. Relatively uniform, the thin marly limestone contains banks of thousands of compacted sea shells. The fossils and fragments of frost shattered rock helps aerate the slopes and aid drainage. One fossil found in abundance is a small, comma shaped oyster, Exogyra virgule (virgule being the French for comma). The vineyards themselves sit on a series of low hills where the limestone is generally exposed on the shallow slopes; these being generally considered as the best sites. One such lieu-dit is the east facing ‘Les Pierres Plates’. With a pH of 8.5, the 35% active lime content accelerates the rate of maturity, often ripening Sauvignon eight to ten days ahead of equivalently orientated sites, despite receiving less sun than many other parcels in the appellation. The summits tend to be covered with more alluvial soils made up of gravel and sand which are more susceptible to drought and humidity. The wines produced here - mostly Pinot Gris and Sauvignon - tend to be the less durable. More sand and gravel can be found in sites closer to the river, although these are less prone to drought. As one heads north of the commune of Reuilly the limestone disappears altogether and at Chéry, the northern-most limit of the appellation, the vines are located on an alluvial plateau of sand and gravel. Given its location, Preuilly understandably shares the same calcaire lacustres du Berry (alluvial sand-clay soils) found on the banks of the Cher at Quincy, although there is more red-orange clay here, which is at least more suited to Pinot Noir than the rest of Quincy appellation. Such is the complexity of the soil types of Reuilly, a study produced by the Chambres d’Agriculture du Cher et de l’Indre in 2000 identified the following essential seven soil profiles within the appellation. This represents 2% of the viticultural zone on the western extremity of the appellation although no vineyards are established here. The single largest profile represented in 38% of the viticultural zone. This profile is located on the left bank of the Arnon, in particular around Reuilly and Diou. Mostly on south and east facing slopes where there is a risk of soil erosion. The pH is high and there is a risk of Chlorosis and also stress in dry seasons. This represents 6% of the viticultural zone and is found located on the left bank of the Arnon around Reuilly and Diou mostly on south facing slopes. The profile typically has limestone on the surface mixed with between 35% and 45% clay. These are deep soils which can retain too much moisture and are highly alkaline meaning Chlorosis can pose a risk. There are also issues of potential erosion on the slopes, but otherwise good porosity. This represents 12% of the viticultural zone. Mostly on the slopes, the exposure is either north or west. Heterogeneous soils made up mostly of clay and sand with some gravel and galets. Close to neutral pH. There is risk of erosion on the slopes, but no problem with chlorosis. The second largest soil profile in the appellation representing 26% of the viticultural zone, it is the soil type most likely to be planted to vines, since three-quarters of it is south facing. Surfaces are mostly sand mixed with gravel and quartz and between 8-15% clay. The soils are generally healthy for the vine, although can become waterlogged where the clay is compacted. This represents 8% of the vineyard zone and is made up of deep clay based soils in shallow basins. Not suitable for the cultivation of the vine. Represents 8% of the viticultural zone and located on the plateau to the west of the town. The soils have very few stones, but are instead made up of silt and clay or silt and sand. The success of the variety within the Berry (the variety represents 70% of the surface area of the vineyards of the Centre Region) is perhaps best explained by the grapes ability to express itself on the specific soils of the region, combined with characteristic aromatic profile derived from this continental climate. There are around 15 clones available to the growers of Reuilly, although two - 108 and 378 - are most widely recognised for quality production. Others grown include 530, 159 and 107. In 2008 the variety accounted for 103 of the 196 hectares planted in Reuilly. It is believed that Pinot Noir was first planted in Sancerre in the 15th Century and was the sole variety grown there until the arrival of phylloxera. Its appearance in Reuilly is much more recent, yet its distribution within the appellation has increased significantly since the mid 1980s and 1990s - from 33 hectares in 1995 to over 60 hectares in 2009. There are nine recognised clones available; recommended though are 115, 114, 777 and 667, although one grower, Jean Tatin has elected to return to massale selection for his recent planting in ‘Le Commanderie’ in Preuilly. The variety performs best on the deeper red clay soils of the appellation and as such tends to enjoy the best sites. Those planted on sand tend to produce simple wines for early drinking (which is why it is considered unsuitable for planting in Quincy). The current demand for gris, albeit mostly local, ensures that there is a complete undersupply of the variety in the appellation. At 34 hectares, it accounts for just 15% of all plantings in Reuilly despite a doubling in hectarage since 1995. Known locally as Pinot Beurot (or Pinot Burot), it is best suited to the poorer, free draining sand and gravel soils of the higher parts of the appellation. The variety appears to perform better on south-west facing sites. The growers tend to have a love-hate relationship with the variety; disliking is fickle and unreliable nature. Its small berries are prone to shriveling during the latter stages of the ripening period, tricking growers that they might harvest 65hl/ha but then end up with just three-quarters of that. But they love it as a cash crop; the money is in the bank by the following spring. Due to its lower acidity it is normally the first grape to be picked - especially in dry years – usually one week ahead of Sauvignon Blanc and Pinot Noir. With such high demand, there is also an incentive therefore to pick as soon as possible in order to protect the crop and to avoid any potential loss in yields. In addition to Sauvignon and Pinot Gris, documents which date back as far as the 1860s refer to mixed plantings of Gamay, (locally refered to as Lyonnais and widely planted prior to AC in 1961, but excluded from the appellation laws), Cot (Malbec), Genouillet, Durif, Gouais, Muscadelle, Meslier-Semillon, Alicante-Bouschet, Grand-Noir de la Calmette and numerous hybrids, including Noah which Jean Tatin confirmed was once planted in the lieu-dit of ‘Le Commanderie’ in Preuilly. In the 1850s vine density was between 8,000 and 12,000 vines per hectare (vph) and propagated by marcottage. Today the décret for the appellation states that there should be a maximum of 1.45 metres between the row and 1.20 metres maximum within the row; equating to a minimum of 5,500 vines per hectare. Whilst actual densities of around 6,300 vph would be more common, the prime motivation for the grower is deciding on the optimum spacing for the use of machinery, specifically the mechanical harvester. Today, the appellation allows for either Guyot Simple (pruned to a maximum 10 ‘eyes’) or Guyot Double (12 ‘eyes’) with the latter more likely to be used for the more vigorous Sauvignon. For several years now reports of Esca, a fungal disease (which is also known to some as vine measles of vine cancer) found throughout France have been increasing. Esca, like eutypoise, attacks the roots and the wood blocking off the sap. Over a period of just a few weeks, the vine stresses and dies. Historically, the best known treatment was arsenic du soude (Sodium Arsenite), but the product was, understandably, banned by the European Union in 2001 because of public health concerns (it’s believed to be carcinogenic) and wider environmental issues. In Reuilly, growers began to notice the high incidence of Esca attacking their Sauvignon vines within two years of the ban on Sodium Arsenic being implemented. The average loss to the appellation to date has been around 5% (or around 0.7ha) per year, with the problem appearing to accelerate when the season is dry, such as in 2003 (when it first caused concern) and 2005. Closely associated with water stress, the plants asphyxiate when there is insufficient water available. Losses have been less evident in the more humid years of 2007 and 2008. Evidence indicates that it is the most vigorous and productive varieties that suffer most with growers in Reuilly were loosing between 6-7% of their Sauvignon vines a year during the 2006 and 2007 seasons. This high rate now appears to have slowed as the majority of affected vines have since been removed, but the net result is a loss of between 15-20% of production due to unproductive vines. If left without treatment, entire vineyards would be dead within a decade. Needless to say, growers offer their own theories when discussing the issue of Esca. Jean Tatin in neighbouring Quincy believes there is an incompatibility between grafting Sauvignon onto 3309 rootstock. Others blame poor soil preparation or the nurserymen for supplying them with substandard plants. ‘Is it a co-incidence that the affected vines all seem to be between ten and twenty years old…?’ There is a general consensus, however, that once the vine moves into its third decade it appears less prone to attack. One solution (apart from the obvious one of replanting) is to ensure that pruning cuts are very clean. A couple of growers even state that certain pruning methods make the vine more permeable to the fungus. Guyot Simple might be easier to maintain and is less work, but some vignerons are starting to adopt Guyot Double instead; the theory being that this method allows the sap to rise faster than the esca can attack - although for the moment it remains just a theory. Finally, where a vine might still deliver a crop whilst being affected, the fruit is said to be ‘tainted’ and unusable. The financial consequences for the growers are simple to comprehend; the choice is to continue to work with an uneconomic crop (yields of 6hl/ha have been recorded in affected plots) or face the alternative of grubbing up and replanting (at a cost of between € 3 and € 5 per vine), then waiting for three seasons to take off the first crop. To this end, local and national government have not been slow in coming forward to offer their support, with Région Centre pledging € 600,000 over four years and the state also releasing a further € 1.5 million for scientific research. But clearly, an environmentally compatible solution to combating Esca needs to be found. Thankfully, whilst Pinot Noir has been affected, it is to a much lesser extent. To date, Pinot Gris appears to be immune. Fercal is the most widely used rootstock as it is considered to be the most resistant to chlorosis (a problem associated with soils high in calcium), and is capable of ensuring that the natural vigour associated with Sauvignon is kept in check. The need to use Fercal for Pinot Gris is negated since most plantings are on more sandy soils. Here, either SO4 or 41B are the most popular choices. There are some local nurseries, but most elect to buy their new vine stock from pépiniéristes in the Vendée and Loire Atlantique. The superficie classée (the total amount of land that qualifies for the right to the appellation) is 600 hectares meaning that some 400ha is not currently planted. Looking at the statistics below, the figure for 1970 looks low, but it has to be considered that this was prior to the 1973 boundary revision which bought the communes of Preuilly, Cerbois and Lury-sur-Arnon into the appellation. The 19th Century figures are added for historical interest. An arpent, incidentally, is a pre-metric French unit of area based on the Roman actus and is roughly equal to one acre (0.404ha). It is still in common usage today in Quebec as well as several areas of the United States that were once part of French controlled Louisiana. Vinification should, in theory, be conducted within the Reuilly appellation but exceptions appear to be tolerated by the authorities. Both Jean-Charles Borgnat and Jacques Tatin vinify their Reuilly at the Cave Romane within the Quincy appellation whilst Gérard Bigonneau has established a central cellar on his cereal farm just outside Brinay for processing both Quincy and Reuilly. Around half of the production of the appellation is vinifed white. As a point of reference, Sauvignon accounted for just 600 hectlitres a year in the early 1970s. The generally formulaic approach to fermenting and ageing Sauvignon Blanc is little different in Reuilly to anywhere else in the world. On the whole grapes arrive at the cellar already de-stemmed (a function of mechanical harvesting) and will have already been sprayed with some preserving dry ice in the vineyard. The grapes are pressed, normally within two hours of picking, and the must is allowed to settle at around 6-7° Centigrade. In order to qualify for the appellation, the potential alcohol of the Sauvignon must needs to achieve 10.5%, although the last time chaptalisation was required to any real degree was in 2004. Fermentation is conducted using selected yeasts, of which there are around a dozen different commercial strains to choose from. The most popular in the Chai de Reuilly is a Burgundian strain known as ‘Elegance’. Only a couple of growers within the appellation are prepared to rely on indigenous yeasts for their ferments; one is Denis Jamain for his ‘Les Pierres Plates’ cuvée. After fermentation is complete the wines are racked and generally allowed to rest on their fine lees for around five months before bottling. Claude Lafond told me that he likes to think of his gris as being ‘vinous’ and should be appreciated in the same way as a normal dry white wine. It should also not be confused with Reuilly Rosé (see below), since gris is obliged to be produced solely from Pinot Gris and needs to achieve a minimum of 10% potential alcohol for the right to the appellation. The wine is vinified with the colour in mind (those who taste and grant the right to sell under the appellation are apparently obsessed with the depth and colour), ensuring that it is neither too deep nor overtly pink. Pressurage direct is the most widely adopted method, although maceration (normally over a 24 hour period - to extract more colour and flavour) is also permitted. Fermentation is conducted using a single commercially accepted yeast strain. Bottling tends to happen as soon as the wine is ready, partly because of the demand for the wines to be available by the time the local white asparagus appears (it’s a local tradition to serve them together at table) and partly due to the economics of supply and demand; most growers are sold out of the current vintage by the end of summer. Legislation allows for up to 15% of Pinot Noir to be added into Pinot Gris during vinification, but then this should be referred to on the label as Rosé rather than Gris (although this rule is often not adhered to). The decision to do this might depend on how productive a year it has been - given the current pressure on Pinot Gris - and if the grower might be sitting on excess stocks (of the harder to sell) Reuilly Rouge. Some might elect to add some Pinot Noir juice to their Pinot Gris simply to help salmonée the wine, whilst others produce a Reuilly Rosé as a by-product of a saignée when, in weaker vintages, they attempt to concentrate the must of their red wines. Reuilly Rosé made exclusively from Pinot Noir is rare - I only came across one such example during my research - at Domaine Beurdin in Preuilly – although Jean-Michel Sorbe, who was also based in Preuilly, apparently did the same. Maceration and saignée are both permitted, but Jean-Louis Beurdin prefers pressurage direct, even if the logic to this is that this is how his grandfather did it. Red musts need to achieve a minimum 10% potential alcohol. As with the Sauvignon and Pinot Gris, Pinot Noir is mostly machine harvested although an increasing number of growers are moving to hand harvesting (or at least the more quality conscious ones are now passing through their vines immediately before harvest to eliminate grapes that shouldn’t be picked). Other producers argue that the key to quality of the resulting wine is not in the ability to either hand or machine harvest, but rather in the soil type and yield. Invariably then, the grapes arrive at the cellar de-stemmed and are immediately crushed and transferred to tank where they are inoculated with cultured yeasts (no single grower in the appellation appears to depend on natural yeasts for their red wines). A handful of growers are experimenting with barrel ageing part of their Pinot Noir production, with generally very mixed results (Reuilly is not Burgundy, even if the climate and soils are very similar). The tank aged wines are racked and allowed to rest on their lees for around six months before bottling. For the most part, these are light, easy drinking reds that are destined for consumption during the summer months following the harvest. The harvest in Reuilly is traditionally between 20th September and 15th October. The earliest being in 2003 when picking commenced on the 19th August. These notes are based on my various post-harvest visits to see Denis Jamain , but have been embellished by reports issued by the Bureau Interprofessionnel des Vins du Centre (BIVC). The harvest was very good despite the fact picking started 10 to 12 days later than the two preceding years; around September 21st versus September 11th in 2009. The ban de vendange for Pinot Gris was on the 20th and the 22nd for both Sauvignon and Pinot Noir. The yield was also plentiful – 55hl/ha for Sauvignon, 63hl/ha for Pinot Gris and 48hl/ha for Pinot Noir – as the flowering was consistent and the season was relatively easy with no issues of rot or mildew. There was rain in early September which helped swell the grapes, but this was balanced by sunny, dry conditions prior and during the harvest. The acidity content was low in comparison to 2009 and much lower than in 2008, so for this reason the growers decided to harvest as quickly as they could (ensuring that alcohol levels remained low too), especially in light of the rain that was predicted to arrive in the region on the 5th October. Although it did rain for three days the crop was already in the cellar. August and September’s ideal weather and a limited yield make 2009 an exceptional vintage. The principal vegetative stages (budburst, flowering and véraison) occurred up to 2 days earlier than the average of the last fifteen years. Following a relatively cold and dry winter, April began with three weeks of temperatures 3°C higher than the norm although there was plenty of rain. May was also warm. June and July were normal for the season while higher than usual temperatures appeared again in mid-August. While not excessive, precipitation often arrived in the form of thunderstorms giving between 20 mm and 30 mm of rain. Unfortunately, the village of Preuilly was a victim of one of the storms and some growers here lost 30% of their crop. The regular watering maintained the humidity of the soil at a sufficient level until véraison. Mildew was a constant threat and remained a concern throughout the season. The dry months of August and September preserved the excellent sanitary state of the crop. Sugar levels progressed very rapidly and attained particularly high levels; one must go back to the famous 1947 vintage to find such high concentrations thorough the entire crop. Acidity levels remained in place primarily thanks to cool nights during the first half of September and the dry period. Only a few cuvées picked at the very end of the harvest lacked a little acidity. Overall, the yields were among the lowest seen in recent years. Denis Jamain was the first in the appellation to start harvesting – in ‘Les Pierres Plates’ on the 11th September (although the ban de vendange was on the 14th in Reuilly). The harvest extended over three weeks with the long, slow ripening benefical for the fruit. In Reuilly, Pinot Noir and Sauvignon Blanc were harvested at the same time. Denis Jamain commented that these were the best juices he had seen in the past decade, although his yields were down (47hl/ha for both the reds and white wines and 60hl/ha for Pinot Gris) due to issues during flowering. There was certainly no need to chaptalise this vintage with wines achieving between 12.5% and 13.0% naturally. The Sauvignons in Reuilly seem very aromatic this vintage as opposed to those in Quincy which appear a little more restrained than in 2008. This is one of the latest vintages of the last ten years. The start of the growing season was tough, with plenty of rain and the threat of disease early on. May was warm, but then temperatures descended to lower than is usual for the period. In addition, dates of the vine’s principal vegetative phases were similar to the 1980s with budburst around the 25th April followed by regular and uninterrupted growth, but flowering was long and irregular. Véraison occurred between 20th and 25th August. Thanks to inspection and control methods mildew, while virulent, was bought under control. September was hot and dry but the cooler nights prevented excessive degradation of malic acid and permitted a favourable evolution of aromas in the Sauvignon. Harvesting began first in Reuilly on the 22nd September (15 days later than in 2007) due to higher levels of acidity. It was a small crop overall with irregular sized berries and bunches due to the problems at flowering. After an early budburst, the risk of frost became a serious concern. This was followed by an exceptionally warm spring which prompted early flowering. Work in the vineyard needed to be performed quickly due to the rapid growth of the vines which were by this point already three weeks ahead of normal by the beginning of June. But the summer months were cool and rainy and up to the end of August worried winemakers surveyed their vineyards. The threat of cryptogamic diseases such as mildew and rot required total vigilance. Fortunately, during the all-important late summer period, nature presented the growers with 29 consecutively dry days, starting on the 24th August with a cold north wind which helped to dry out both the soil and vines. This was followed by warmer days and cool nights. In these conditions, sugar production was accelerated and the degradation of acids was slowed (although this is still seen as a vintage with high levels of malic acid). The assimilation of water by the berries having been well-regulated by the drying of the air and the soil, the phenomenon of concentration appeared in certain parcels. This became widespread in the red grapes in the beginning of September which intensified colour and quality of tannins. The aromas of the white grapes were slowly developed during the ripening stage which was long despite the precocity of the year. The harvest in Reuilly ran from the 9th to the 24th September, but the parcels were picked as the grapes became ready over the span of a month. Unusually, Pinot Noir was picked before Sauvignon. This particularly long period reflects the flowering periods which were spread out until maturity and the wisdom of the winemakers who patiently waited for the optimum moment to harvest. Denis Jamain stated that by the time of harvest there was absolutely no sign of the rot that blighted other local Sauvignon appellations. This was a hot and dry year marked by large climatic variations. After a dry winter the vine's vegetative cycle began with welcome humidity. March and May were particularly wet. This created water reserves in the surface soil levels that were to prove very useful. June and July were very hot and dry compared to the seasonal average (+2°C for June, +5°C for July). These conditions suited vines where the growth was already two weeks earlier than normal. In August, temperatures were -3°C lower than usual, whilst September - 2.5°C above the seasonal average - brought two weeks of very hot temperatures and no rain. The second half of the month was mild with a few light scattered showers. By the time of harvest the grapes were in excellent condition, with both sugar and potential alcohol levels rising quickly towards the 14th September after which they assumed a normal rhythm. Acidity and pH levels remained good thanks to the stability of the tartaric acid throughout the maturation. Cloudy skies beginning in mid-September permitted the preservation of aromatic intensity and freshness. The grapes were harvested in record time. Picking was concentrated during the optimum period of 10-12 days; any sooner and the grapes would have been insufficiently ripe and later they would have begun deteriorating. The ban de vendanges for Reuilly was the 10th September, with Quincy starting to harvest on the 13th September. Unusually, the harvest in Reuilly started with Sauvignon this year, rather than Pinot Gris. An extraordinary vintage. Generally warm and dry, the season was punctuated by alternating hot and cool periods. The very hot temperatures encouraged a rapid development of the vegetative cycle through the end of July. A cool but dry August (there was only 15mm of rain in Reuilly) allowed the vines to recover and begin the maturation phase. The low amount of precipitation, regular and moderate, provoked an early stop of the vegetative growth. The healthy condition of the vines combined with particularly favorable weather conditions. The moderate temperatures had a very positive affect. Acidity was balanced and remained stable to the end of the harvest. Winemakers approached the harvest confident in the knowledge that the dry soil and absence of a rot permitted them to pick each parcel at the moment of optimum ripeness. The harvest began in fair weather. Unusually, the first grapes to be picked in the Berry were in Sancerre - on the 7th September. Reuilly started with Sauvignon Blanc, rather than Pinot Gris, on the 9th September (with Quincy a day later) and was completed by the 21st of the month. After 2003, this was the earliest ever recorded harvest in Reuilly. This was the vintage of the decade to date and the best year since 1996. After the unusual heat wave of 2003, there was a return to aromatic and fresh wines in 2004. The vine growth cycle was relatively about 8 days late when compared to the last 20 years. Night time temperatures were normal but daytime figures were often below average which helps to explain the slow vegetative cycle. The season began calmly and was relatively dry with a virtual lack of vine diseases. On the 7th July there was a thunderstorm, the hail not only damaging the fruit but also affecting the baguettes which inevitably had a detrimental effect on the following year’s yields. Due to the storms the conditions became more humid with mildew and oidium also becoming a threat and requiring very close monitoring. The first half of September was dry and warm with temperatures of 25° to 30°C which accelerated grape development and consolidated the problems caused by the July rains. Then sugar accumulation returned to its usual pattern and the reduction of acidity slowed. Conscious of the importance of the harvest date and despite the advancement of the season, winemakers wisely exercised patience and waited for full maturity. By offsetting the risk of losing part of the harvest, they succeeded in optimizing the quality of the grapes. Harvesting began on the 20th September in Reuilly. In addition, the vast majority of grapes were picked and brought in under the best conditions and lower acidity toward the end of the season compensated for some of the higher levels experienced at the beginning. Vital for quality in 2004 was the elimination of surplus grapes during the growing season. This was a vintage that has required a great deal of attention throughout the year, both in the vineyard and in the cellar. Remembered as a very hot year and the earliest harvest since 1893. During the vines vegetative cycle from the 1st April to the 30th September, the average temperature was more than 2.5°C above normal. For long periods (the second half of April, all of June, between the 10th and 25th July and the first half of August), temperatures were between 4°C to 10°C above the seasonal average. These high temperatures had a negative influence on both quality and quantity. Parcels of young vines suffered burned leaves and grapes resulting in significant losses. Yet 2003 was not a year of excessive drought: timely rain between the 30th June and the 4th July and again on the 17th August provided sufficient moisture. The typical September weather pattern began in late August: cool nights, morning dew and warm afternoons, but by this time the crop was already in the cellar. Sugar levels continued to climb right through the harvest achieving levels of concentrations rarely seen before, but acid levels tumbled leaving flabby, short lived wines. Reuilly, acknowledged as the hottest place in France this season, started the harvest on the 19th August. Quincy began in the first days of September. This was generally a harvest to avoid. Spring frosts threatened but in the end caused little damage. Flowering was extremely fast due to a hot spell in June which resulted in some issues of flower abortion. High temperatures in mid-August ensured véraison was completed homogenously and the harvest started in mid-September in cool but dry conditions. Overall, this is a very successful vintage. The mild winter favoured an early budburst. The flowering was between the 10th and the 25th June. The vegetative season was more humid than in recent years with the threat of mildew requiring constant vigilance. The climate of 2001 divided the maturation into two phases. September's cool temperatures slowed the ripening and acidity levels remained high which prompted those brave enough to make the decision to delay the date of harvest by about ten days in order to obtain good maturity. The first couple of weeks of October brought warm weather (day and night) which rapidly accelerated the ripening of the grapes, ensuring a rise in sugar levels, the balancing of acids and refining of Sauvignon aromas. Returning to more normal harvest dates, the first grapes were harvested in Reuilly and Quincy around the 25th September. In Reuilly, Pinot Noir was harvested before Sauvignon and required strict sorting, both in the vineyards and in the cellar, in order to eliminate unripe or otherwise inferior grapes. The harvest of white grapes started soon after and many winemakers, encouraged by the continuing fair weather, chose to wait as long as possible before harvesting – some delaying until the 15th October. They were well rewarded; the last grapes harvested being in good condition. The start of the growing season began around April 15th - a little more precocious than in an average year. An unusually hot period in May and June speeded up the vine growth and in the middle of June the flowering was practically finished. A cool and humid July slowed the evolution, obliging wine growers to pay careful attention to the state of the foliage. From the month of August the climate was favourable, with the maturation taking place slowly. The last three weeks of the month were excellent, ensuring a good important accumulation of sugars and well balanced acidity. The weather remained mild which allowed the wine growers to harvest parcels as they ripened. The harvest started around September 13th for the Pinot Gris varieties and around 18th September for the earliest Sauvignon. A good season throughout. The main vegetative steps began early with budding commencing between the 6th and 10th April. Flowering occurred between the 10th and 20th of June. Summer storms obliged wine growers to be very vigilant concerning the strong pressures of mildew. From the end of August to the middle of September warm days and nights speeded up the maturation process and developed very healthy grapes. The official harvest date for Reuilly was the 13th September for the picking of the Pinot Gris. A return to a very classical vintage. After a normal berry setting, hot weather in August scorched some grapes. Rain in September gave rise to fears of rot but the good health and surveillance of the vines permitted harvest of good quality. March was very warm and the accelerated ripening posed potential problems with the risk of frost in April. Cold weather in June caused problems with flowering. Storms in August meant there were threats of disease. Finally, the grape harvest took place in good conditions. The exceptional weather conditions from spring to autumn permitted a harvest that was exceptionally healthy. This is generally considered the best vintage in Reuilly since 1990. A classic if undistinguished vintage. A year badly affected with frost. A rainy September and cool temperatures delayed the maturation. Nevertheless the good health of the grapes produced a very classical vintage. This year was marked by rain at harvest. Like everywhere in the Loire, the vineyards of Quincy and Reuilly suffered the damages of a particularly devastating spring frost. The harvest was small but heterogeneous. An exceptional vintage. The weather conditions were excellent from the blossoming to the grape harvests. The grapes were early-fruiting and the maturity was perfect.